Spray like the pros with our Fuji Spray® DIY-PRO series. Whatever your project, you’ll need a sprayer which gives you the power you need to apply any coating while achieving awesome results. Our powerful 2-stage systems have professional features such as a non-bleed spray gun and a fan control dial to adjust pattern size from small circular to wide (and all increments in between). Entry level HVLP spray systems typically feature low wattage motors that are underpowered for most spraying. Our powerful 1400 watt 2-stage bypass motor in a metal turbine case can handle any type of coating. 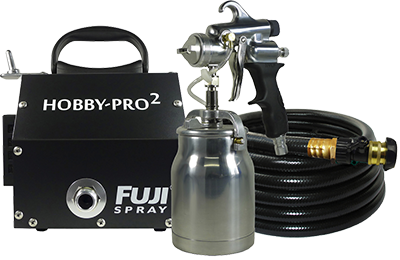 The Fuji Spray® Hobby-PRO 2™ and the Fuji Spray® Semi-PRO 2™ will allow you to obtain an outstanding finish making you look like a professional. This budget-friendly series will take care of all your home, workshop and garden projects.